A selection of plain, half and fully coated Belgian chocolate biscuits. Luxury Belgian Biscuit Selection. Traditional favourites and new creations made by our master Belgian biscuitier. Belgium has a long, proud tradition of both chocolate and biscuit making. 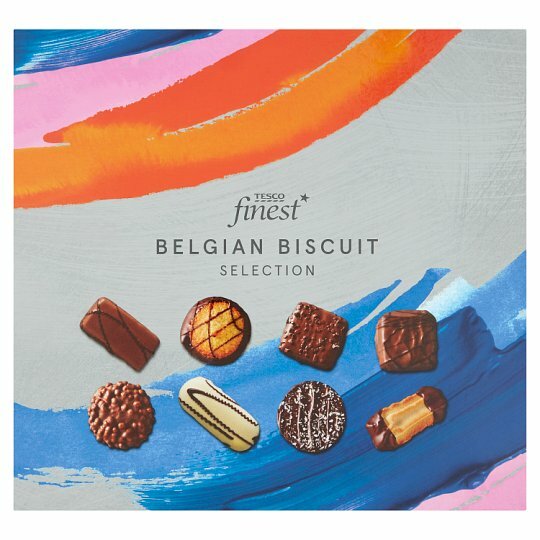 This selection is made for us by our master biscuitier and each chocolate biscuit is generously finished with smooth Belgian chocolate. Discover new varieties alongside favourites you know. INGREDIENTS: Wheat Flour, Belgian Milk Chocolate (22%), Sugar, Belgian Dark Chocolate (12%), Palm Oil, Belgian White Chocolate (3.5%), Plam Kernel Oil, Butter (Milk), Coconut Oil, Rapeseed Oil, Pasteurised Free Range Egg, Rice Flour, InvertSugar Syrup, Soya Flour, Dextrose, Glucose Syrup, Dried Skimmed Milk, Coconut, pasteurised Egg White, Fat Reduced Cocoa Powder, Salt, Hazelnut Paste, Dried Whole Milk, Cocoa Mass, Hazelnut, Flavouring, Sunflower Oil, Whey (Milk), Milk Sugar, Raising Agent (Sodium Bicarbonate, AmmoniumBicarbonate, Dicalcium Diphosphate), Wheat Starch, Water, Cream (Milk), Wheat Gluten, Malted Wheat, Emulsifier (Soya Lecithins), Cocoa Butter, Butteroil (Milk), Vanilla Extract. Belgian Milk Chocolate contains: Sugar, Cocoa Butter, Dried Whole Milk, Cocoa Mass, Milk Sugar, Emulsifier (Soya Lecithins). Belgian Dark Chocolate contains: Sugar, Cocoa Mass, Cocoa Butter, Butteroil (Milk), Emulsifier (Soya Lecithins), Flavouring. Belgian White Chocolate contains: Sugar, Cocoa Butter, Dried Whole Milk, Emulsifier (Soya Lecithins), Flavouring. Belgian Milk Chocolate contains: Cocoa solids 31% minimum, Milk solids 16% minimum. Belgian Dark Chocolate contains: Cocoa solids 46% minimum. Belgian White Chocolate contains: Milk solids 23% minimum.